Panda Cloud Antivirus Pro Edition is a cloud-based and advanced security software that provides comprehensive protection to users against viruses, spyware, and rootkits. It is connected in real-time to PandaLabs’ online Collective Intelligence servers to protect faster against the newest malware variants while barely impacting PC performance. It can be configured to disable the Autorun feature to help protect users from viruses that propagate via flash drives. It also includes “automatic USB vaccination” to keep users from falling victim to malicious activities. Many users do not mind paying to get good antivirus software to stay away from virus, spyware, spam, malicious activities and give them peace of mind. But why pay if you can get this excellent professional antivirus software, Panda Cloud Antivirus Pro Edition which normally costs $29.95 for free? To get a free Panda Cloud Antivirus Pro Edition 1 year with a valid activation Key Code, users can grab the promotional free license giveaway offered which is valid only until 30 October 2010. Users firstly need to go to the promotional site at https://www.trialpay.com/cart/?pp=VhvVjhW7&c=a6bdab2. Users will thence need to key in their First Name, Last Name and a valid email address and click on the continue button. Once it is done, users need to confirm and verify their order by clicking to the link in the email received. Users will thence be redirected to a new page where the 1 year Free Activation Key code of Panda Cloud Antivirus Pro Edition is given. 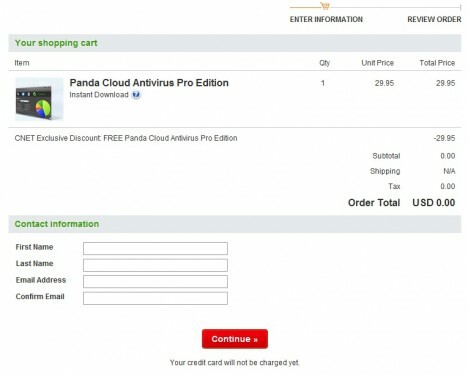 Users can download Panda Cloud Antivirus Pro Edition via the download link in the page itself. Once users have installed it, they need to activate the antivirus software with the free activation key code given.